Since the last time we issued a mock draft roundup, the NFL’s free agency period began and the Green Bay Packers did not sit idly by, making many signings — most of which shored up the defense. However, that second Packers first-round pick has a bit more mystery to it, at least with prognosticators. Note: Some drafts do more than one round (the Packers also have multiple picks in the fourth and sixth rounds). As always, when including a mock we used last time, we’ve also added the previous prediction so you can see how things changed (or not). DraftTek (7 rounds): Round 1a — T.J. Hockenson, TE, Iowa; Round 1b — Juan Thornhill, S, Virginia; Round 2 — Jeffrey Simmons, DT, Clemson; Round 3 — David Edwards, OT, Wisconsin; Round 4a — Darrell Henderson, RB, Memphis; Round 4b –Antoine Wesley, WR, Texas Tech; Round 5 — T.J. Edwards, ILB, Wisconsin; Round 6a — Kris Boyd, CB, Texas; Round 6b — Ryan Finley, QB, NC State; Round 7 Landis Durham, DE/OLB, Texas A&M. Previously: Round 1a — Montez Sweat, DE/OLB, Mississippi State; Round 1b — Noah Fant, TE, Iowa; Round 2 — Simmons; Round 3 — Emanuel Hall, WR, Missouri; Round 4a — Max Scharping, OT, Northern Illinois; Round 4b — Sheldrick Redwine, S, Miami (Fla.); Round 5 — Rodney Anderson, RB, Oklahoma; Round 6a — Jah’Shawn Johnson, S, Texas Tech; Round 6b — Tytus Howard, OT, Alabama State; Round 7 — Chime Edoga, G, USC. Robert Klemko of SI.com: Round 1a — Noah Fant, TE, Iowa; Round 1b — Johnathan Abram, S, Mississippi State. Luke Easterling of The Draft Wire (4 rounds): Round 1a — T.J. Hockensen, TE, Iowa; Round 1b — Mack Wilson, LB, Alabama; Round 2 — Debo Samuel, WR, South Carolina; Round 3 — Michael Deiter, OG, Wisconsin; Round 4a — Devin Singletary, RB, FAU; Round 4b– Renell Wren, DL, Arizona State. Previously: Round 1a — Montez Sweat, DE/OLB, Mississippi State; Round 1b — Noah Fant, TE, Iowa; Round 2 — Taylor Rapp, S, Washington; Round 3 — Andy Isabella, WR, UMass; Round 4a — Justice Hill, RB, Oklahoma State; Round 4b– Blake Cashman, LB, Minnesota. John Clayton of the Washington Post: Round 1a — Jonah Williams, OT, Alabama. “By signing Za’Darius Smith and Preston Smith, the Packers no longer have a need at edge rusher. Adrian Amos filled a need at safety. Those moves give the Packers the flexibility to take the best player available, which is Williams in this scenario. They could develop him as a guard until he is ready to take over as a starting tackle.”; Round 1b — Marquise Brown, WR, Oklahoma. Previously: Round 1a — Clelin Ferrell, DE, Clemson; Round 1b — Dalton Risner, OT, Kansas State. Eddie Brown of the San Diego Union-Tribune (3 rounds): Round 1a — Andre Dillard, OT, Washington State; Round 1b — Nasir Adderley, S, Delaware; Round 2 — Irv Smith, TE, Alabama; Round 3 — J.J. Arcega-Whiteside, WR, Stanford. Previously (2 rounds): Round 1a — Deionte Thompson, FS, Alabama; Round 1b — Zach Allen, DE, Boston College; Round 2 — Chris Lindstrom, OG, Boston College. Don Banks of Patriots.com: Round 1a — Brian Burns, DE/OLB, Florida State. “The Packers could go a lot of different ways with this pick. Tight end, receiver, defensive tackle or linebacker could get the first-round love. But to repeat, in the rare draft that is rife with quality pass rushers, it’s wise to try and come away with one of them. Burns is a fast and athletically gifted prospect who helps add the edge rush that the departed Clay Matthews once provided in Green Bay.”; Round 1b — Taylor Rapp, S, Washington. Previously: Round 1a — Devin White, LB, LSU; Round 1b — Chauncey Gardner-Johnson, S, Florida. 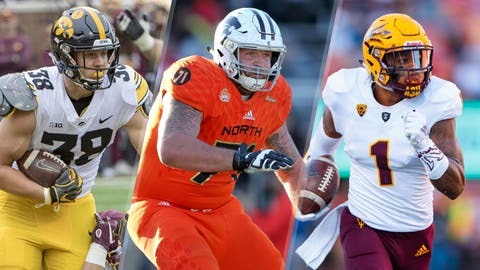 Chad Reuter of NFL.com (4 rounds): Round 1a — T.J. Hockenson, TE, Iowa; Round 1b — Johnathan Abram, S, Mississippi State; Round 2 — Kaleb McGrary, OT, Washington; Round 3 — Zach Allen, DE, Boston College; Round 4a — Anthony Johnson, WR, Buffalo; Round 4b — Trayveon Wiliams, RB, Texas A&M. Previously (3 rounds): Round 1a — Montez Sweat, DE/OLB, Mississippi State; Round 1b — Elijah Holyfield, RB, Georgia; Round 2 — Irv Smith Jr., TE, Alabama; Round 3 — Ben Powers, OG, Oklahoma. Dan Kadar of SB Nation: Round 1a — Noah Fant, TE, Iowa. “Aaron Rodgers hasn’t had a tight end with 60 or more receptions since Jermichael Finley in 2012. Jimmy Graham was decent last season, but at 32, his career is winding down. Fant could find himself as Graham’s replacement and a reliable pass catcher for Rodgers.”; Round 1b — Dalton Risner, OG, Kansas State. Previously: Round 1a — Brian Burns, DE/OLB, Florida State; Round 1b — Chris Lindstrom, G, Boston College. Walter Cherepinsky of WalterFootball.com (5 rounds): Round 1a — T.J. Hockenson, TE, Iowa; Round 1b — Greg Little, OT, Mississippi; Round 2 — Jerry Tillery, DL, Notre Dame; Round 3 — Mecole Hardman, WR/KR, Georgia; Round 4a — Cameron Smith, LB, USC; Round 4b — Michel Jordan, G/C. Ohio State; Round 5 –Ben Banogu, DE/OLB, TCU; Round 6a — Ben Powers, G, Oklahoma; Round 6b — Michael Jackson, CB, Miami. Previously (5 rounds): Round 1a — Clelin Ferrell, DE/OLB, Clemson; Round 1b — Taylor Rapp, S, Washington; Round 2 — Irv Smith, TE, Alabama; Round 3 — Jordan; Round 4a — Isaiah Buggs, DE/DT. Alabama; Round 4b — Jamal Davis, LB, Akron; Round 5 –Jordan Brailford, DE/OLB, Oklahoma State. Pro Football Focus (Steve Palazzolo and Mike Renner alternating picks): Round 1a — Jerry Tillery, DL, Notre Dame. “Tillery is that good. Tillery is a top-10 player in this draft class.”; Round 1b — Andy Isabella, WR, UMass. Charles Davis of NFL.com: Round 1a — Ed Oliver, DT, Houston; Round 1b — A.J. Brown, WR, Mississippi. Will Brinson of CBSSports.com: Round 1a — Noah Fant, TE, Iowa. “Packers fans want this team to go after defense but if you look at their free agency splurge, they can afford to get Aaron Rodgers some more weapons. Also why wouldn’t you want to add another matchup problem in Fant who can learn from Jimmy Graham (how to jump or something)? Give Rodgers all the weapons.”; Round 1b: Parris Campbell, WR, Ohio State. Previously: Round 1a — Fant; Round 1b — Nasir Adderley, S, Delaware. Ryan Wilson of CBSSports.com: Round 1a — Brian Burns, DE/OLB, Florida State; Round 1b — Juan Thorhill, S, Virginia; Round 2 — Kaleb McGary, OT, Washington; Round 3 –Riley Ridley, WR, Georgia. Previously (1 round): Round 1a — Rashan Gary, DE/OLB, Michigan; Round 1b — Noah Fant, TE, Iowa. Charlie Campbell of WalterFootball.com (4 rounds): Round 1a — Cody Ford, OL, Oklahoma; Round 1b — Parris Campbell, WR, Ohio State; Round 2 — Irv Smith, TE, Alabama; Round 3 — Chase Winovich, DE/OLB, Michigan; Round 4a — Anthony Nelson, DE/OLB, Iowa; Round 4b — Trysten Hill, DT, Central Florida. Previously: Round 1a — Jachai Polite, DE/OLB, Florida; Round 1b — Taylor Rapp, S, Washington; Round 2 — Tre Lamar, ILB, Clemson; Round 3 — Winovich; Round 4a — Nelson; Round 4b — Kaleb McGroy, OT, Washington. Vinnie Iyer of the Sporting News: Round 1a — Devin White, ILB, LSU. “White covers a ton of ground against the run, and also would upgrade the Packers intermediate coverage. He is easily the rangiest defender in the 2019 class and will thrive under Mike Pettine to round out the Packers’ front seven makeover. White showed off his elite speed and athleticism at the Combine in a compact package (6-0, 237 pounds).”; Round 1b — Irv Smith, TE, Alabama. Previously: Round 1a — Clelin Ferrell, DE, Clemson; Round 1b — Smith. Justin Rogers of the Detroit News: Round 1a — T.J. Hockenson, TE, Iowa; Round 1b — N’Keal Henry, WR, Arizona State. Previously: Round 1a — Jachai Polite, DE/OLB, Florida; Round 1b — Hockenson. John McClain and Aaron Wilson of the Houston Chronicle: Round 1a — McClain: T.J. Hockenson, TE, Iowa; Wilson: D.K. Metcalf, WR, Mississippi; Round 1b — McClain: Marquise Brown, WR, Oklahoma; Wilson: Garrett Bradbury, C, South Carolina. Previously: Round 1a — McClain: Rashan Gary, DE/OLB, Michigan; Wilson: Hockenson; Round 1b — McClain: Jonathan Abram, S, Mississippi State; Wilson: Erik McCoy, C, Texas A&M. Mark Mosher of Pro Football Weekly: Round 1a — T.J. Hockenson, TE, Iowa; Round 1b — N’Keal Henry, WR, Arizona State. Doug Farrar of the Touchdown Wire: Round 1a — T.J. Hockenson, TE, Iowa. “Aaron Rodgers finally managed to escape the mess that was Mike McCarthy’s playbook, so as a reward, let’s give him the most complete tight end in this class to help expand his passing game as much as new head coach Matt LaFleur. Hockenson is a dynamic blocker, but don’t let that scare you off his promise as a multi-route receiver.”; Round 1b — N’Keal Harry, WR, Arizona State. Previously: Round 1a — Rashan Gary, DL, Michigan; Round 1b — Chauncey Gardner-Johnson, FS, Florida. Bryan Fischer of Athlon Sports: Round 1a — Jawaan Taylor, OL, Florida; Round 1b — Irv Smith, TE, Alabama. Previously: Round 1a — T.J. Hockenson, TE, Iowa; Round 1b — Jachai Pilite, DE/OLB, Florida. Eric Galko of Optimum Scouting: Round 1a — Cody Ford, OG, Oklahoma; Round 1b — A.J. Brown, WR, Mississippi. Rick Serritella of NFLDraftScout.com: Round 1a — Devin Bush, LB, Michigan; Round 1b — Chris Lindstrom, OG, Boston College. MyNFLDraft.com: Round 1a — Rashan Gary, DE, Michigan; Round 1b — Taylor Rapp, S, Washington. Brad Biggs of the Chicago Tribune: Round 1a — Noah Fant, TE, Iowa; Round 1b — Marquise Brown, WR, Oklahoma. Mark Inabinett of al.com: Round 1a — T.J. Hockenson, TE, Iowa. “The Tennessee Titans lined up in 12 personnel 32 percent of the time under offensive coordinator Matt LaFleur in 2018, the fourth-most in the NFL. LaFleur is now the head coach of the Packers, and Hockenson paired with Jimmy Graham would keep the 12 option open for LaFleur in Green Bay.”; Round 1b — Johnathan Abram, S, Mississippi State. Clint Lamb of Athlon Sports (3 rounds): Round 1a — Noah Fant, TE, Iowa; Round 1b — Chauncey Gardner-Johnson, S, Florida; Round 2 — Kaleb McGary, OT, Washington; Round 3 — Cameron Smith, LB, USC. Scott Wright of Draft Countdown: Round 1a — Brian Burns, DE/OLB, Florida State; Round 1b — Johnathan Abram, S, Mississippi State. Chris Trapasso of CBSSports.com (2 rounds): Round 1a — T.J. Hockenson, TE, Iowa. “Jimmy Graham and Hockenson would be a formidable duo over the middle in Green Bay and would really open things up for Davante Adams on the outside.”; Round 1b — Cody Ford, OL, Oklahoma; Round 2 — Josh Jacobs, RB, Alabama. Previously (1 round) Round 1a — Jachai Polite, DE/OLB, Florida; Round 1b — Noah Fant, TE, Iowa. Nick Klopsis of Newsday: Round 1a — T.J. Hockenson, TE, Iowa; Round 1b — Dalton Risner, OL, Kansas State. Previously: Round 1a — Rashan Gary, DE/OLB, Michigan; Round 1b — Risner. Kevin Hanson of edsfootball.com (3 rounds): Round 1a — T.J. Hockenson, TE, Iowa; Round 1b — Dalton Risner, OG, Kansas State; Round 2 — Nasir Adderley, S, Delaware; Round 3 — Oshane Ximines, DE/OLB, Old Dominion. Tom Fornelli of CBSSports.com: Quinnen Williams, DL, Alabama. “With Quinnen Williams falling down the board the Packers get aggressive, sending picks No. 12 and No. 30 to the Jaguars for picks No. 7 and No. 69. Williams gives Packers defensive coordinator Mike Pettine a versatile, talented piece to work with.” Previously: Round 1a — Montez Sweat, DE/OLB, Mississippi State; Round 1b — (Trade out of first round with Giants). Alex Khvatov of NFL Draft Blitz: Round 1a — T.J. Hockenson, TE, Iowa; Round 1b — Marquise Brown, WR, Oklahoma. Previously: Round 1a — Devin White, LB, LSU; Round 1b — Chase Winovich, DE/OLB, Michigan. Sean Wagner-McGough of CBSSports.com: Round 1a — T.J. Hockenson TE, Iowa; Round 1b — Nasir Adderley, S, Delaware. Previously: Round 1a — Deionte Thompson, FS, Alabama; Round 1b — Jachai Polite, DE/OLB, Florida. Jonas Shaffer of the Baltimore Sun: Round 1a — Brian Burns, DE/OLB, Florida State; Round 1b — Chris Lindstrom, OG, Boston College. Final tally: Like we hinted at above, mock drafters like an Iowa tight end for the Packers with their initial first-round pick. T.J. Hockenson was tabbed 14 times for Green Bay’s top pick, No. 12 overall. Noah Fant was second with five. The rest were a mix of positions and only two players were mentioned multiple time: Brian Burns, with four, and Cody Ford, with two. For Green Bay’s second first-round pick, No. 30 overall, there’s definitely more of a mix, with 11 players receiving multiple selections, led by Johnathan Abram and Marquise Brown with four each. N’Keal Henry and Dalton Risner were chosen three times, while Nasir Adderley, A.J. Brown. Parris Campbell, Chris Lindstrom, Taylor Rapp, Irv Smith and Juan Thornhill each got two nods by mock drafters.